Meet & Greet on arrival at Jaipur Railway Station / Airport & transfer to hotel. Check-in to hotel. In the evening you can take an optional tour to visit Laxmi Narayan Temple (Birla Mandir) & Chokhi Dhani - An Ethnic Village Resort. Back to hotel. Overnight stay at Jaipur. It is one of the famous cinema hall , here most the people like to see movie in this theater because its best and show timings are 12: 15 pm , 3:15pm, 6:15pm and 9:15pm. Maximum Duration of Visit: 2:0 hrs. 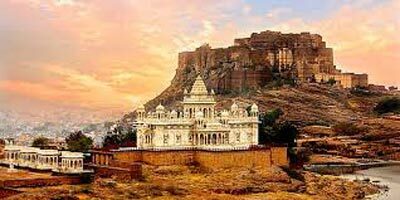 Mehrangarh Fort is one of the most imposing and largest forts not only in Jodhpur but in the whole India. It is a fort that oozes the charm and grandeur of a bygone era. It is situated five kilometres. 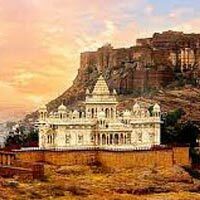 Jaswant Thada, a royal memorial of the Rathore clan, is located around half a kilometer away from the Mehrangarh Fort. It was built in 1899 AD as a memorial for Maharajah Jaswant Singh II by his son. Maximum Duration of Visit: 3:0 hrs. This Nathmal Ji ki haweli was commissioned to serve as the residence of Diwan Mohata Nathmal, the then Prime Minister of Jaisalmer. Maharawal Beri Sal commissioned the construction of this Haweli. Just beyond the town you can go on an excursion to the Sam Sand Dunes, a vast area of undulating sands. You can take a jeep into the desert or opt to travel in the traditional style on camel back.